We have a large array of lab-based and field-based equipment appropriate for occupational exposure assessment, movement analysis, and ergonomic measurements. This page describes our current capabilities, but we may be able to expand our capacity through collaboration. These systems are housed within the lab and can be used for simulation studies and experimental designs. Our high-precision hexapod robot has 6-axes with a table capacity of approximately 1000 lbs (R-3000 Rotopod, Mikrolar, Hampton, NH, USA). 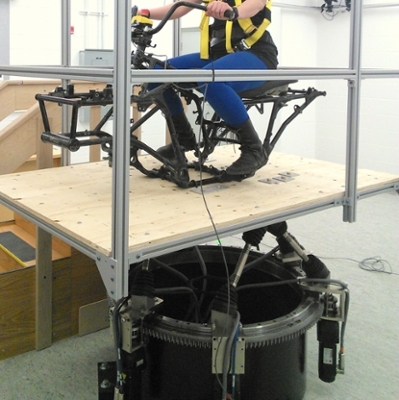 It is currently equipped with an ATV frame and surrounding protective cage to replicate field-based measurements of whole-body vibration collected on Saskatchewan farms. We are conducting a series of lab-based studies with the robot to determine the effects of whole-body vibration from agricultural equipment on biomechanics and human performance. In an upcoming project, the robot will be equipped with a tractor cab fora study evaluating the effects of vibration on tractor egress. We have a 10 camera VICON 3-dimensional motion capture system (T40-S), 1 Bonita camera (720C), and a 64 channel analog to digital (A/D) interface unit (Vicon Motion Systems, Oxford, UK). We also have a Bertec force plate embedded flush with the floor, with 2 Bertec force cubes (PY6) (Bertec, Columbus, Ohio, USA). Together, the VICON and Bertec systems can be combined to facilitate comprehensive explorations into human movement and function, such as measuring both upper and lower extremity joint kinetics, and comprehensive gait analysis. One of the latest additions to the lab is the Novel in-shoe pressure measuring system (pedar-x, Novel, München, Germany), which is used to measure pressures underneath the foot. The system uses capacitive sensor technology, known for its ability to measure very small changes and to provide stable measurements. A unique advantage of the Pedar system over other similar systems is that each of the 99 sensors is individually calibrated. Its wireless functionality makes it appropriate for both field- and lab-based research. We have four insoles that cover foot sizes from a women’s US 7 to a men’s US 11. The Novel pedar-x will be used in an upcoming study evaluating the effects of whole body vibration on tractor egress. We have a Delsys Trigno Wireless EMG System with 12 wireless surface electrodes (Delsys Inc., Massachusetts, USA). This system allows for non-invasive assessment of the activation of superficial muscles. The system is completely wireless (no participant-pack or data-logger required! ), meaning that the system can be applied to a variety of work contexts, and study participants have complete freedom of movement. EMG provides a unique type of biomechanical assessment and no feasible alternative methods currently exist for assessing muscle activity. In addition, each Delsys sensor contains a tri-axial accelerometer, which is useful for measuring body segment positions concurrently with EMG. At full functionality, we can measure 64 channels of data (16 EMG + 48 acceleration). Data can be acquired by dedicated Delsys software (EMGworks) or alternatively through common third party data acquisition systems. In the Ergonomics Laboratory, EMG data is seamlessly synchronized with motion capture, force transducer, and force platform data through Vicon Nexus software. The sensors are suitable for long-duration use (up to 8 hours). The microFET2 is a wireless, digital, handheld dynamometer (microFET2, Hoggan Scientific LLC, Salt Lake City, UT). This dynamometer has the ability to measure peak force and duration, and is intended for use during manual muscle testing activities, such as when participants perform a maximal voluntary contraction (MVC) for normalizing EMG. The microFET2 can measure up to 300 lbs of force in 0.1 lb increments, and can report values in units of pounds, Newtons, or kilogram-force. These systems are robust and portable and appropriate for measurement in working environments outside the lab. We have an I2M Motion Tracking System consisting of 12 SXT posture sensors and a docking station (NexGen Ergonomics, Pointe Claire, Quebec). This portable inertial sensor system is used for ambulatory posture and movement monitoring in occupational settings. The SXT sensors are small (5 x 3.5 x 1.2 cm), and are robust in data storage and battery life - 8GB RAM holds over 28 days’ worth of data, and the battery life allows for wirelessly monitoring more than 8 hours of data. TK Motion Manager and HM Analyzer software packages are used for data analysis. The whole body vibration array is comprised of up to five, 8-channel DataLOG data-loggers (MWX8, Biometrics Ltd.); four tri-axial accelerometers (Series 2A); two inertial measurement units (IMUs); BNC adapters; an external trigger; and a vibration calibrator (Biometrics Ltd, Newport, UK). 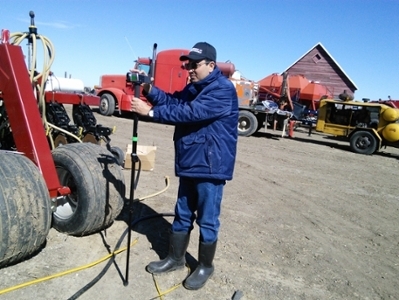 The system allows for 3-dimensional assessment of vibrations at the vehicle floor as well as at the seat and at the operator’s head to examine the vibration attenuation offered by the seat and compare vibration exposures across different types of agricultural machinery. Biometrics Data Management Software 9.0.1, Biometrics Analysis Software 9.0.1, and VATs Analysis Software are used for field-based vibration data analysis. The hand arm vibration system consists of two, tri-axial accelerometers used to measure vibration at the hand and arm. Surface electromyography is a non-invasive tool that measures muscle activity. It has been used extensively in different disciplines of research: as means to identify motor patterns associated with pathology, to test control and reflex mechanisms, to develop muscle models, and by ergonomists as indicators of muscle tension and fatigue, to name just a few applications! In addition to the Delsys Trigno Wireless system, the Ergonomics Laboratory is also equipped with a 16 channel Biometrics EMG system (Biometrics Ltd, Newport, UK). Each sensor is capable of measuring muscle activity at a sampling rate of up to 1000 Hz. 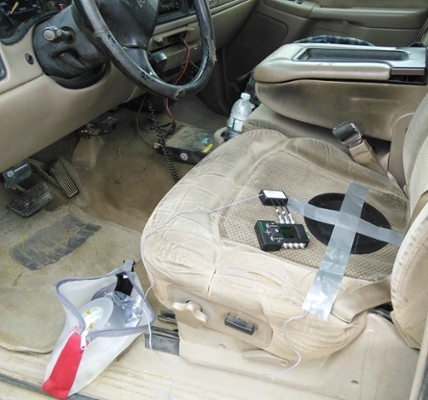 Although the electrodes must be wired to the DataLOG data-logger, participants are untethered, and the sensors have a slim profile which may be advantageous in certain uses. The system is appropriate for prolonged use, with a maximum battery life of up to 20 hours. We have the CyberGlove III (CyberGlove Systems LLC, San Jose, CA) to acquire hand and wrist posture data. The glove has 18 electrogoniometers (HyperSensorTM) embedded in a Lycra® fabric glove which measure wrist flexion/extension and radial/ulnar deviation, transverse palmar arch, as well as finger and thumb joint flexion/extension. The sensor resolution is < 1° with a tested repeatability of < 3°. The data will be collected at 100 samples per second (Hz) and transmitted wirelessly (802.11 WiFi) to a laptop with dedicated software (MoCap Console v.5). Mechanical force can be measured using sensitive piezoresistive devices that convert mechanical strain to electrical resistance and given force values. The Ergonomics Laboratory has the FlexiForce A201 (A201 FSR, TekScan Inc., South Boston, MA, USA) force sensing resistors. These thin and flexible sensors are ideal for diverse non-invasive force and pressure measurements. They are capable of measuring three force ranges: Low 4.4 N (0 - 1 lb), Medium 111 N (0 - 25 lb) and High 445 N (0 - 100 lb). Data can be acquired using a portable battery-powered data-logger (MWX8 DataLOG, Biometrics Ltd., Newport, UK). 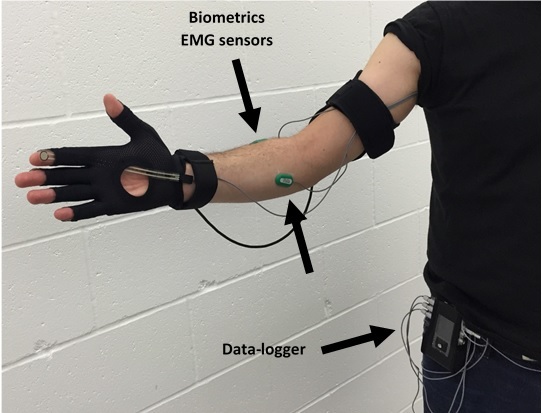 These force sensors can be used to measure handgrip forces when workers interact with tools. We have two camcorders with spare high capacity batteries, chargers, memory cards, and monopods for filming working exposures (SX45 SD, Sony). Video data can be analyzed later in Noldus observer and Nvivo 10 software. In addition, we have a digital SLR camera (EOS Rebel T1i, Canon).